This Eid diners at BiCE can take advantage of the restaurant’s delicious Italian menu. The a la carte menu includes shared starters, pasta and mains with live cooking stations and a dedicated dessert station – perfect for a large family gathering! There will also be a live saxophonist playing laidback jazz tunes throughout the afternoon. Details: Prices start from AED 135, 12.30pm-4pm on Friday 1st September 2017. To book a table bicerest.jumeirah@hilton.com or call +971 4 318 2520. This year Dubai’s favourite desert resort is offering free access for children to the Aladdin’s Kids Club when parents are dining at Al Forsan restaurant. There will also be a limited edition Arabic a la carte menu being served at sunset at Al Sarab rooftop lounge, along with an ‘Eid-al Adha’ Arabian feast served in the air-conditioned Al Hadheerah desert tent. Details: to find out more about the desert resort’s Eid offers visit Bab al Shams. There’s some great UAE Eid deals on this year. We love this offer at Carluccio’s over the long weekend. 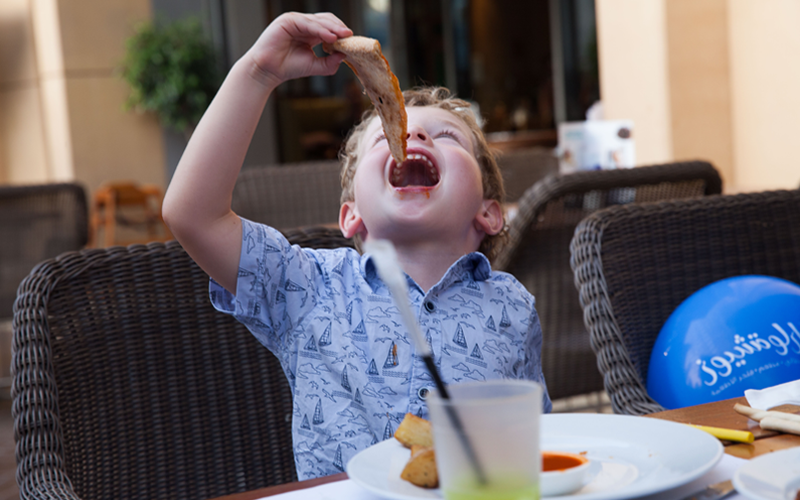 When an adult buys one main course (starting from AED 39) kids get a free three-course meal! The offer is only available over the long Eid weekend (31st August – 3rd September 2017). Details: all restaurants (except airport outlets) in Dubai and Abu Dhabi are included in the deal from 31st Aug-3rd Sep 2017. For more information, visit Carluccio’s. Previous Post&LeftArrow; Previous Jigsaw launches new business lunch for ONLY AED 49!